Responses are from the 2013 post-event survey. Which location for the rally do you prefer? The vote was split (see chart) which makes decision making really challenging for us! We have decided that for 2014, the event will have activities at both Deals Gap Motorcycle Resort and Fontana Village. Friday evening festivities will be held at Deals Gap and Saturday evening will be held at Fontana. A more detailed schedule will announced closer to the event. What shirt color would you like for next year? There were two shirts that edged out the traditional black color and they were purple and red. You’ll have to wait until next year to determine which one we will select! Does the event date (weekend after Labor Day) create challenges for you to attend the event? We’ll let the pie chart do the talking for us again! We will continue to ask this question each year to let you decide if our date should change. What is your main motivation for attending the rally? Please note that these will not add up to 100% due to the ladies being encouraged to select all that apply. Which group photo did you participate in? We had about 64% make it to both of our group photos. As much as we would love to reach 100%, based on the feedback we’re starting to believe that goal may just have to stay a dream. But we are not going to give up and if you have thoughts or suggestions of how to realize this goal, by all means send them our way! How interested would you be if we added the following ideas to the event or in addition to the event? Based on this feedback, possibly look for some new and returning activities for 2014. Will you recommend this event to other women sportbike riders? Will you attend this event again? The feedback regarding the “Not Sure” response was due to the date creating conflicts. Please provide any suggestions or feedback you may have in order of us to improve this event. Thank you! Here are the responses we received with a few replies from us! WSR reply: We are very thankful for the sponsors who elect to send us free product, but we also think they would love to see us ladies actually wearing them as well. We’ll make a better effort to let our sponsors know that realistic sizing for the demographic who attends this event. WSR reply: Great idea! We’ll add that to our list of things to improve. WSR reply: We’ll definitely consider that for 2014, thank you! WSR reply: We were bummed too. Time really got away from us on Friday and we had to make that call. WSR reply: We really let this simple idea get away from us. We’ll definitely make that a standard moving forward. WSR reply: Thank you for the feedback and based on the first question above, we will be doing this in 2014. However, we have confirmed that the 50 racing will continue on Saturday for those who will want to catch the finals after our evening activity! More to come on that! WSR reply: You’re too kind, thank you! WSR reply: Thank you so much! We do love hearing this, but we know we’re far from perfect. Let us know what we can improve on, anytime…not just after the event. Let us know, anytime! WSR reply: We are thankful that all the male guests (who must be the guest of a registered female) who attend have demonstrated true support for the integrity of the event. We do recognize the need to provide opportunities for the ladies to interact more which is why we begin the event on Friday with the ladies only photo followed by dinner where we kick the guys out for a little while (very nicely, of course). We do not want to alienate them completely as that would likely prevent some ladies from attending, but if you (or anyone) have thoughts that may help us balance this challenge, by all means send them our way! WSR reply: We do too! Many ladies arrive early so we’re thinking about putting together a Thursday event of some sort for the early birds! Stay tuned! WSR reply: We get this kind of feedback a lot and the main reason we stopped advertising group rides is due to liability. Although we would love to believe that those who attend this event would never sue us for <insert whatever negligence they want to come up with here> it’s something we are still concerned could happen. As a result, since we’re just a small, non-profit run by volunteers, the risk just did not seem worth it. We are looking into ways to make this possible, however, but it does add operational expenses to the event. We definitely haven’t stopped considering putting these back on the schedule though. Trust us, we’re looking into it! WSR reply: You’re absolutely right! We plan to rectify this moving forward! WSR Reply: We agree and we hope the Super Silent Auction will continue to grow with all ranges of bids possible. WSR Reply: Welcome to the addiction and hope you come back next year! WSR Reply: We raised another $2,000. We’re getting ready to change up a few things with the hopes to finally nudge this number upward! Stay tuned! WSR Reply: Over the years, the feedback has been very different depending on who we talk to. It’s a challenging spot to be in as organizers because we honestly want to do what is best for the participants and the event as a whole, not just a few. Unfortunately it will never be possible to make everyone completely happy but hopefully we can compromise and do what is best for the majority. We plan to continue our post event survey to get a pulse of how everyone feels so we can continue making decisions with the best interest of the participants at heart. 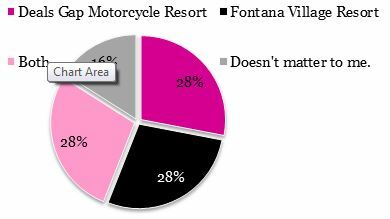 For 2013, not only was the vote completely split on where to have the 2014 event activities, but also where people actually stayed varied well beyond that of Fontana and Deals Gap. It’s definitely a challenge for us to make decisions. WSR Reply: Thank you so much! We’re glad you were able to meet some new people and enjoy yourself. Please, please, please let us know how we can get better! 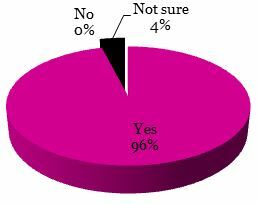 All ladies of the 2013 event received the survey. We had a 43% response rating. If you would like to see the survey results, just let us know.